No matter how young they are, if kids are going to make healthy food choices that’ll set them up for successful school days, they still have to be reached with your fresh message: School lunch is tasty and good for you. That’s where marketing—to both students and their decision-making parents—comes in. Worthy started with a logo. She spent less than $1,000 last fall with a consultant to develop a bold red and black logo with a green-framed strawberry. That way, she thought, all her subsequent branding of the district’s foodservice program would stand out. Social media platforms can be the fastest way to share up-to-the-minute images and news. Foodservice directors at many schools agree: Facebook is best for reaching parents (who love to share and tag each other in photos of their kids eating lunch). And for Gen Z, focus on Twitter and, perhaps even more, on Instagram. Of course, social media favorites can vary by region, district and even school. In Virginia’s third-largest district, the 82,000-student Loudoun County Public Schools, Twitter is huge. Every teacher is encouraged to have his or her own account. Still, because kids love Instagram, Marketing and Community Outreach Coordinator Stefanie Dove has been playing with Instagram stories and the geotagging option, which has allowed the district to expand the reach of a single post from an audience of 36 to 9,000 people. She’s also working to get Instagram embedded in the district’s Mobile Menus app. Instagram has also been a great outlet for promotions and giveaways that drive participation in Orange County Public Schools, Orlando, Fla.’s 218,000-student district. Jennifer Smith, the district’s area manager for marketing and catering, and her team will give away food items or prizes from vendors if students participate in promos such as the upcoming “Don’t Be a Chicken—Try Something New” campaign, which requires students to take a selfie with a new item every week. Some school districts have developed their own dedicated apps that can be downloaded by both kids and parents. Tuscaloosa County has had success with its MealViewer app, which includes menus, allergy information and dish ratings. The district invested a $300-per-school fee for initial setup when it launched in 2016, and now pays $180 annually per school. Worthy, the child nutrition director, loves that kids give blind ratings to menu items and that she can break out those results by school. And for many districts, videos mark the next frontier. Loudoun County has generated interest with in-the-kitchen videos made with a GoPro camera strapped to a student’s head and posted to Facebook. Greenville County Schools, a 76,500-student district in South Carolina, plans to launch a cooking series this fall featuring more than a dozen of its most popular recipes, such as sweet Thai chili chicken, scaled down to make at home. Greenville’s videos will live on the district’s website. No matter how snazzy the pics, the key question for many districts is whether social media actually drives school lunch participation. And there are now ways for them to find out. Orange County has already launched meal preordering at two high schools through the Nutrislice app. This fall, the district plans to begin tracking the number of meals preordered through Facebook, Twitter and Instagram. To excite younger kids who might not be on social media yet, consider curriculum-based events. Prince William County’s food and nutrition services worked with its Office of Student Learning to develop special learning events for kindergarteners through fifth-graders. It started in 2014 with a pilot event for second-graders: a cornhusking race to shuck local Virginia corn that’s cooked and served in the cafeteria the following day. And the district’s efforts touch each grade. Kindergarteners put on chef hats and aprons for Kitchen Career Tours. First-graders write a step-by-step how-to book on preparing Graham Banana Bites, a popular cafeteria side dish that many want to make at home. Third-graders do a math-intensive Fraction Fruitapalooza. Fourth-graders link food to the economy and social studies through a Virginia Grown Farm Festival. And fifth-graders undertake a Caught You Being Healthy Challenge that involves snapping pictures (to be publicly posted) of staff and peers practicing healthy habits such as drinking water, washing their hands and eating veggies. Every event not only teaches something, but also ties into school food. Kitchen tours are a regular occurrence in Greenville County Schools, where even the youngest kids see where their food is made. The program’s chefs are also committed to dedicated cooking events with special-needs students twice a month. And any schools that cultivate fruits and veggies show off with garden tours. “We will help them harvest and educate, and usually the garden club students will help prepare butternut squash or kale or melons,” Food and Nutrition Services Director Joe Urban says. Kids see anything from a food truck as trendy, Urban says. So in the beginning of 2017, when he spotted a surplus bread truck on a state website for $11,000, Urban thought it was a great deal. For $39,000, his team retrofitted it as a food truck for pop-up events at the district’s middle and high schools. The truck parks behind the kitchen at that day’s school so the dishes can be prepped inside, then rolls to where the students will spot it from the cafeteria. Orange County takes a similar trend-driven approach with its food truck, shown below, which has tested cutting-edge menu items such as Korean barbecue wraps and Caribbean jerk tacos since 2013. The truck’s best-sellers eventually hit the main cafeteria line. Meal participation averages 11% higher on food truck days, Smith says, and menu items tagged as Food Truck Favorites sell 4% higher than average. On a smaller scale, with golf carts ubiquitous in Florida, Orange County also got the idea to retrofit a few to serve hot and cold foods. 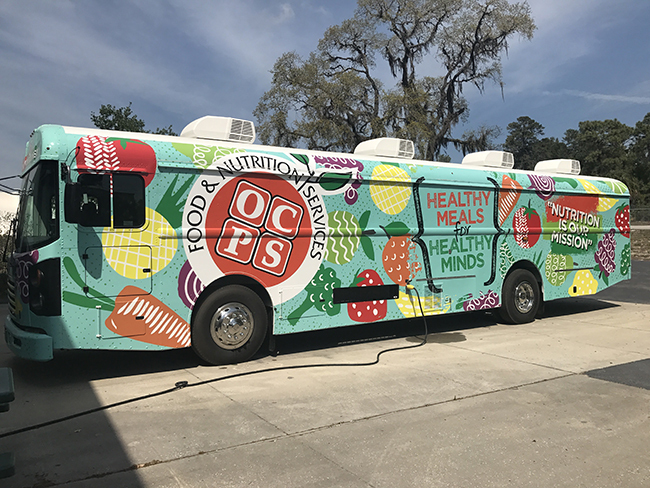 The district launched its first mini fleet of Cruisin’ Kitchen mobile carts in 2015, covered in colorful paint and tropical graphics, with an investment of about $15,000 each. This fall, Smith will put nine more in Orlando high schools, reaching convenient spots such as the senior parking lot, to make sales the program might otherwise miss. Tuscaloosa has doubled breakfast participation in tests with its new mobile breakfast carts, which will launch throughout the district this fall. The carts will feature chicken biscuits, prepackaged items and even smoothies. Worthy plans a six-week breakfast campaign to help promote the morning meal in middle and high schools, complete with colorful window clings, table tents and iTunes gift cards, for about $400 per school. Plenty of districts capitalize on National School Lunch and National School Breakfast weeks as a launch pad for promotional events. In Prince William County, Ronk’s team came up with the idea to hold a National School Lunch Week Chant Challenge two years ago. Students submitted two-minute videos promoting school lunch or nutrition with cheers and rhymes. The district was amazed that a third of its schools participated, including many high schools. The winner at each level was given a giant check for $500 that the school could spend on wellness programs, such as gardens or a rock wall. When Ronk delivered the check to the winning high school, she was blown away by the enthusiasm—and still gets goosebumps remembering it. Cafeteria staff were featured in the winning video, and they stepped out to be recognized at the awards presentation, too. Partnerships with local restaurants, culinary competitions and even a food festival round out the special events in Greenville. Cafeteria Takeovers began at the district in 2016 as collaborations with some of the higher-end local restaurants where students aspire to eat. Chefs work with cafeteria staff on the entire menu, including dishes like a whole-hog barbecue or certified Angus beef short rib sliders with truffle fries. To stoke foodservice career ambitions, the program has also held culinary competitions since 2015. Teams of four high schoolers spend two weeks perfecting their recipes before having a live cook-off. The winners get their recipe on a school menu. And Euphoria Greenville, a four-day food, wine and music festival that regularly draws Michelin-starred chefs, gives the Greenville school food program more visibility. During the festival’s Sunday brunch events, which bring in around a dozen of the nation’s best pit masters, Urban arranges for four kids to prepare food on stage in front of almost 400 people as part of a kids’ cooking competition.